"You can take the raddest line in the Cascades and it doesn't even compare to the Gervasutti Couloir." Or so I was told by a well-traveled young alpinist. Deep umbrage on behalf of our beloved backyard hills notwithstanding, this statement really made me want to learn about the "great ranges." It's hard to trust anybody's word when you already know everything, but I wanted facts, so I found myself at Metsker's Maps near Pike Place Market. Repeated trips there have become an expensive habit over the past few fortnights. Curiosity grows exponentially, along with a collection of LANDESCARTES DER SCHWEIZ and some beauties from the Institut Géographique National. Running amok in Metsker's, some Canadian beauties also caught my eye. Naughty nubile neighbors: so close to home. 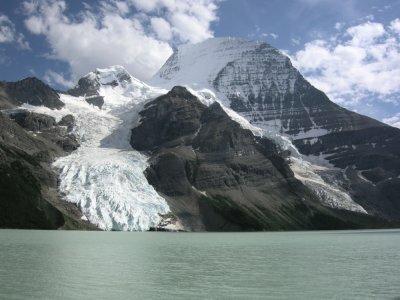 A few days stewing with a 1:25,000 of Berg Lake Trail and Mount Robson, plus a little convincing myself that the climate up there is totally different and worth a late-July look, and we were ready for an international incident. I had the map, which - by my picaresque code of ethics - should be more than enough. 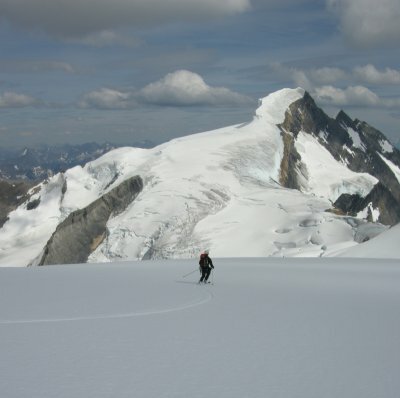 Searches around Seattle for Selected Alpine Climbs in the Canadian Rockies were unfruitful. Our goal was to ski the North Face. I negelected due diligence to know the standard route in case we deemed it unskiable on the climb. We overcame many cruces en route to Robson: a border crossing, leaky tires, lots of gear to forget, and prohibitively expensive beer. Somehow we made a nice bivy next to a "no overnight parking" sign near the main Mt Robson Provincial Park Visitor Centre within a reasonable day from Seattle. Thanks for providing the truck, Dan. Dan dwarfed by Robson River and Mt Robson towering 10,000 ft above him. 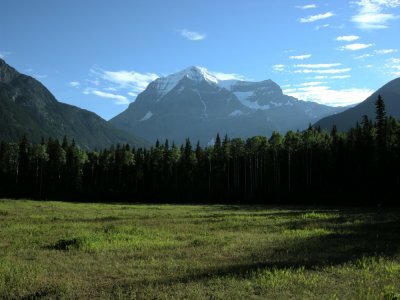 The next morning we awoke to views of the south side of mighty Mt Robson towering 10,000 ft (! 3,000 m) above us. A little gear sorting and a big pot of coffee were all that we needed before departure. The trail is very well maintained and the campsites and shelters are beautiful. 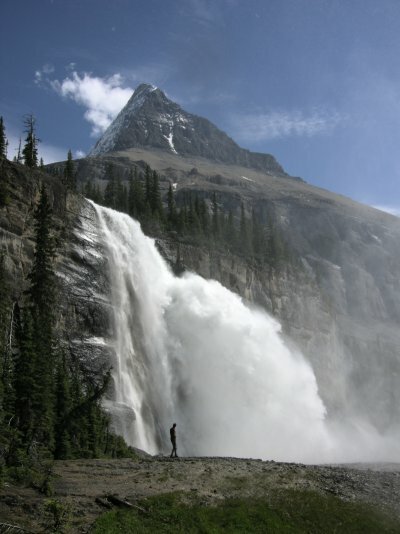 We took a break in the shelter at Kinney Lake, then a short rest before the steeper bits up the Valley of a Thousand Falls, a stop at Emperor Falls, and before we knew it we were working on whiplash to look at the Emperor Face. Fresh snow encouraged us. The North Face looked as good as I would have dared to hope. It was time for a discussion before Berg Lake. 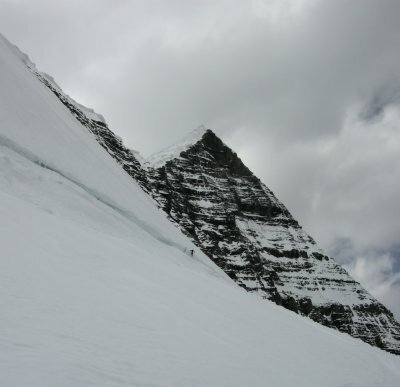 The standard scrambly rock buttress approach to the North Face begins near the climber's left side of the Mist Glacier. It was hard for me to ignore my ignorance regarding the Kain Route and Robson Glacier, should we need to bail above the North Face. 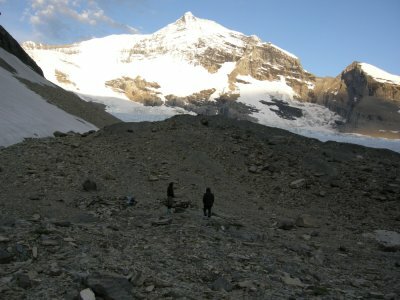 We agreed to take the "easy" route and do some extra hiking to approach up the Robson Glacier, with the goal still being the North Face. 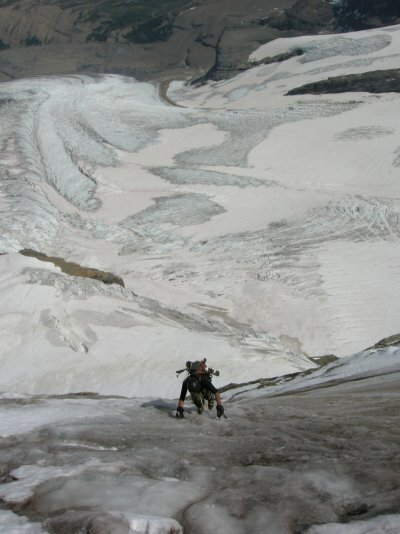 A question from where we changed into boots and crampons to walk up the tongue of the Robson Glacier: "Do you think it goes?" 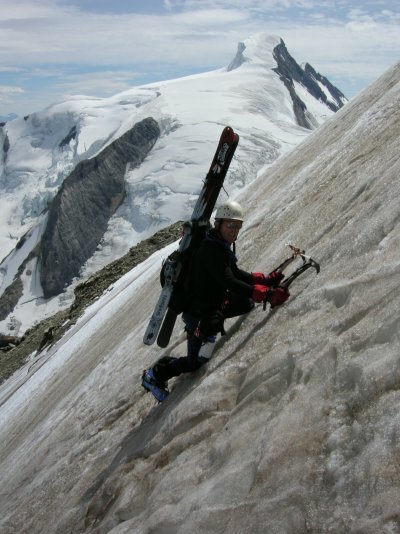 A reply: "It'll say more about our mountaineering skills than the glacier if it doesn't go." 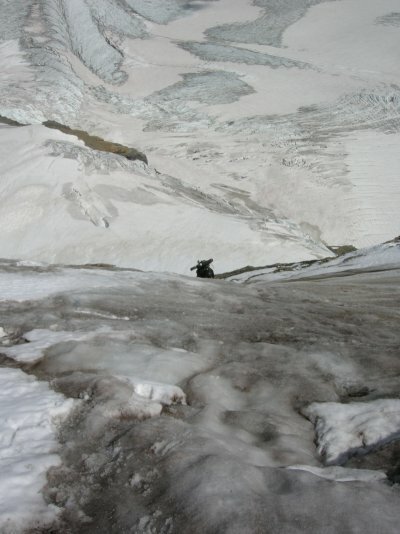 It went fine, with some glacier-exiting shenanigans below the icefall. It was getting late. 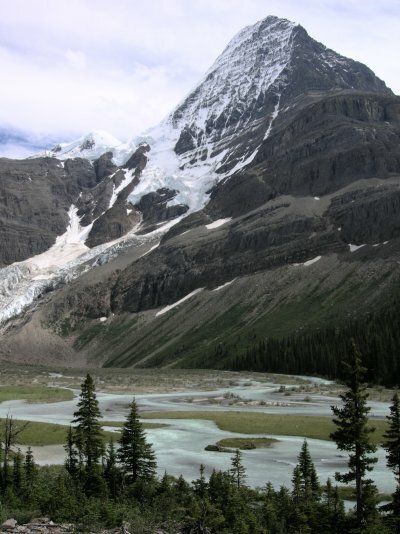 We would have to settle for a camp below Extinguisher Tower, which left a lot of distance to the Helmet-Robson Col. On the upside, camp was quite comfortable. We had a lot of distance to cover. That wouldn't help. But what did help was the deluxe camping. I decided to just relax and enjoy the trip. Crown Royal is good whisky, even more importantly, it's about the only intoxicant that wasn't more expensive in Canada. I ejoyed my liberal lifewater and settled into a good night's sleep. 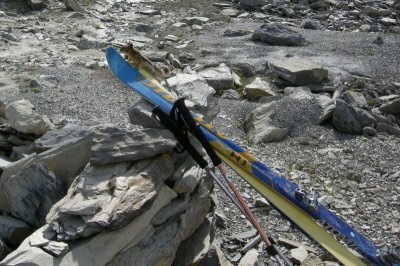 The previous day's twenty-mile hike with both skiing and climbing gear had taken its toll. We all slept past first light. We were happy to get some rest. Now how to get to the Helmet-Robson Col? 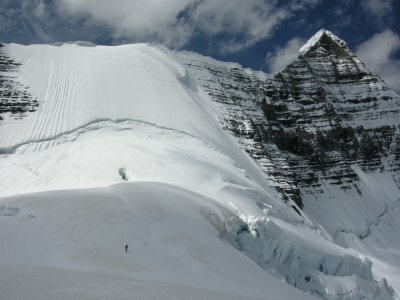 We wanted to go direct, still hoping to climb and ski the North Face in a day. The correct route on the extreme left around the Dome seems obvious now, but that's 20-20 hindsight. From our point of decision just below the Dome, the Mousetrap looked like a terrible option. We climbed the Dome directly. There was some very fun alpine ice near the top. It was quite late for any thought of the North Face by the time we surmounted the Dome. The Kain Face, however, beckoned above us with prime conditions. Dan approaches the Kain Face on skis. The Kain Face reminded me of a bigger Park Headwall. It featured boot-deep mid-metamorphism fresh snow for most of the climb. It was midafternoon when we reached the ridge. The views of the Yellowhead Highway and Visitor Centre were tantalizing... so close, but so far. The sun was done with the Kain Face for the day. 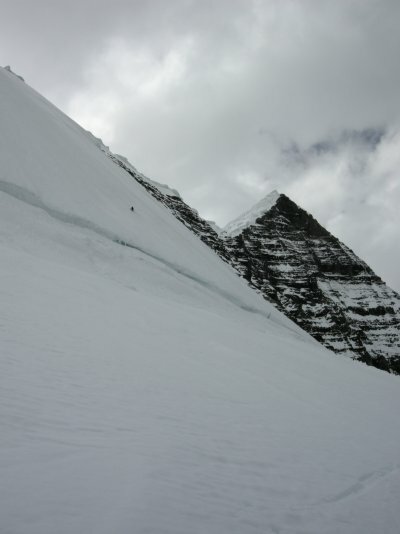 The remainder of the route to the summit looked like it would require routefinding through some unskiable glacier ice. We chose to maximize our enjoyment and ski the Kain Face. The fresh snow provided a good ski surface, but also required some sluff management. Atop the Kain Face, I had spotted what looked to be a navigable path through the Mousetrap. 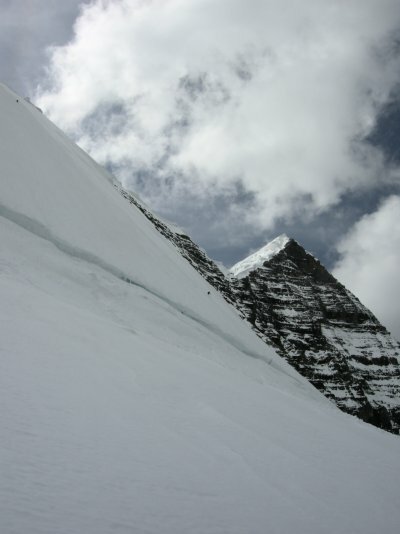 Another exciting steep slope, then a mandatory bergschrund jump, and only some crevasse navigation remained between us and our camp. Ryan skis the Kain Face while Dan waits above. Dan skis the Kain Face. Ryan skis toward the Mousetrap with Resplendent in the background. The little fella liked the sticks. It was most wonderful to spend a lovely afternoon lounging at camp. Down with the Crown, the level of relaxation reached staggering heights. We didn't make the summit, we didn't ski the North Face, but we did ski the Kain Face and I felt like the trip as a whole was a great success. Flexibility prevents injuries: true not only for muscles, tendons, and ligaments; it also works great for goals and egos.